The English Standard Version (ESV) uses a term that I cherish: steadfast love. The King James (KJV) and New King James (NKJV) translate the same phrase as “goodness,” while the American Standard Version (ASV) translates it as “lovingkindness” and the New International Version (NIV84) uses “unfailing love.” Based on what I’ve heard from those who know Hebrew, the original word conveys God’s covenant loyalty, mercy, and love. 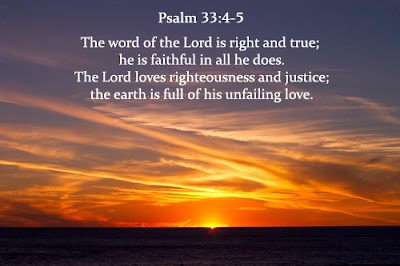 The ESV prefaces Psalm 33 with the heading: The Steadfast Love of the Lord. God’s faithful and unchanging love is a wonderful reminder on any Monday morning, but it’s especially meaningful on this particular Monday morning–as a gray day dawns in a bleak time. Yet these weary circumstances come during the Christmas season, when we celebrate Christ’s first advent and anticipate his second. And that’s a reason to rejoice. play skillfully on the strings, with loud shouts (1-3, ESV). the earth is full of the steadfast love of the Lord (4-5, ESV). Our hindered vision may not always see God’s love of righteousness and justice, but they always exist. The earth pulses with these attributes of God. The whole world overflows with his steadfast love. he puts the deeps in storehouses (6-7, ESV). he commanded, and it stood firm (8-9, ESV). Even when evil seems to win, God is frustrating it. His counsel and the plans of his heart stand firm to all generations. God blesses people and nations who trust in him. He considers them as his own heritage. and by its great might it cannot rescue (13-17, ESV). and keep them alive in famine (18-19, ESV). But God does more than merely keep an eye on his people, he delivers their souls from death and preserves their bodies during life. He promises to keep us alive, even during the times that seem like famines from his presence. even as we hope in you (20-22, ESV). God will provide and protect. Our hearts can be glad in him when we trust in his holy name. Let your steadfast love, O Lord, be upon us, even as we hope in you!